Do you believe in the power of prayer? Or as it is more trendily called lately – cosmic ordering? Do you think that our thoughts carry power? Can our minds influence our future? At the risk of losing any bit of street cred I may have, I do believe that we are powerful beyond our belief. I do believe in the power of positive thinking. I believe in the power of visualisation. I do believe that our thoughts carry power. And ergo as I believe there is a higher power I believe in the power of prayer or cosmic ordering. It therefore goes without saying that my children think I am bats.. well except for the eldest one, now living in Perth, Western Australia where she is making her dreams come true. But my 13year old and my 11 year old definitely do not value my wisdom at all and much to my delight consider me an awful embarrassment. Although recently the universe (or God or whatever) decided to show my 13 year old how visualisation and prayer or cosmic ordering works with amazing results. And I think it might have changed her mind. Regular readers will remember that over the summer and autumn we fostered kittens for the DSPCA. It was hard work and great fun. The last fostering we did was a mammy cat and her 4 black kittens. 13 year old fell in love with one who she was convinced loved her. “He sits on my lap and he loves me” she reported regularly, followed by “can we keep him, pleeeeease”. Now we already have four resident cats – which is loads, so my standard response to her plaintiff cries was “no, we are not going to be a five cat household”. But she went on and on and on… for weeks, for months. Her argument was that none of our resident cats loved her specifically. Kitty (our youngest cat) loves the 11 year old, basically sharing her bedroom day and night. I stood my ground. But one evening at dinner, when I must have been in a particularly mellow mood, she quietly once again made her case for getting her own cat. She described how he would be a gentle, playful cat, black and white and he would love her. She had that distant look in her eyes as she daydreamed about her imaginary cat. She looked at me dubiously but she did shut up. We had about ten days free of her moaning about getting a new cat. Then one afternoon I was coming home town when my phone rang. It was the girls excitedly telling me that a stray cat had appeared in the front garden and wouldn’t go away. This happens occasionally with dogs and cats but usually an owner is found pretty quickly. “Can we let him in the house, it’s really cold out” they implored. “No way” was my answer, with visions of how quickly our house could be destroyed by fighting cats and our dog thrown into the mix for good measure. I told them they could give him some food in the garden but that was it. Amazingly nothing much happened. The other cats were mildly curious but not that bothered. Dylan our daft dog got madly over excited like he does about everything but even that was short lived. So cat was allowed to stay the night. He found one of our cat beds under a radiator and slept for hours. Next morning common sense was again employed. “We must find his owners” I lectured the girls. “We will drive around to see if there are any notices up on nearby estates and then we will take him to the vet to see if he is micro chipped.” There were no notices and there was no micro chip. The vet confirmed that he was about a year old, intact (not been spayed) and in good condition. On Monday in the early afternoon I got a call from the vets. “You don’t still have that black and white cat do you” she asked. At 4pm that day I picked up 13 year old from school and instead of driving home, headed for the vets. When we pulled up outside, she looked at me quizzically. “There is someone here waiting for you,” I said. Sometimes I can be a bit slow on the uptake, even with my own wisdom. The universe had sent my 13 year old her cat, exactly as she had visualised; black and white and full of personality and affection. And yes, he does love her. He sits on her knee and sleeps on her bed. Most of all though he knows that he is where he is meant to be. So now – I want a weekly newspaper column; one where I can write about anything that tickles my fancy or moves me or annoys me. I also want a regular radio gig….reviewing the morning’s newspapers where I could focus on the positive and off beat stories to help cheer us all up? Right – got that Universe? Watch this space!!! 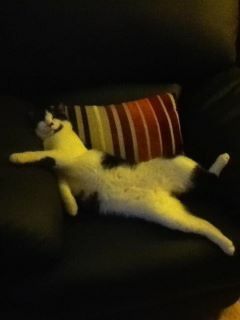 Photo of Felix relaxing (yep, he does sleep that way sometimes) by 11year old! Great story Barbara. Love it. Looks like your latest family member has settled in well! I am also considered “mad”, in a nice way by my family, and believe in the power within us. Thank you for a smile on a dreary Monday morning! Looking forward to your newspaper and radio gig, and also the arrival of your new “project”! dreams come true too! In the meantime, like your daughter, I will continue to visualise my new cat! Lovely story! Had a very similar experience myself just after Christmas. Looks exactly like your cat-fully fledged member of family now-only 3 cats but have fostered & re-homed many in the past. Excellent Barbara… Always knew you were from the WooWoo side of the tracks! 🙂 Now can you be more specific about the Newspaper and the Radio Station you want and the Universe will have something to work with! That's a great story. And that is one cute cat. But I think for your cosmic ordering you should delegate 13yr old daughter to do the business. Maybe she has the power and you don't so just to be sure get her to do your ordering. You'll get your column and the radio gig Barbara. My doctored ordered me to do something similar after my 5th miscarriage. On the 6th try, at 8 weeks, I was told it was all over bar the shouting. That night, I prayed and I prayed and I visualised. The following day I went shopping for baby clothes. .7 months later my miracle arrived and she was/is HUGE. Strangely this never works for the lotto. I LOVE Felix, what a great photo! Amazing story. I love it. I do believe in the power of visualisation, that we can draw the things we keep in our thoughts to us. We need to keep our eyes open for the opportunities, though, and be ready to accept them, even when they seem scary. I'd like. . . no, I won't clog your blog up with this, we'll be here all day! But I will get thinking! Love your blogs! Wanting to subscribe I entered the letters I saw 5 times !! Thankfully the last one was accepted !! Looking forward to more of your delightful blogs and to hearing when you get your wishes! I'm thinking too!!!! Well thanks Barbara – I'm going to give it a go – why not? It's all positive, and I'm glad your little girl got her wish. One of the best stories I've heard this year, but then again I am one of life's big softie!!! I'm more convinced of the power of positive thinking. Do it all the time with traffic lights! That cat has unique looking character. If this doesn't get me a job can I get a refund? Do you normally compose solely for your site or maybe for any other Internet portals?